VTA's Bus and light rail service provides transportation within several cities connecting various destinations throughout Santa Clara County from bus stops, light rail stations, and transit centers. VTA fares must be paid upon boarding buses or at Ticket Vending Machines at light rail stations. Passes may be purchased at locations throughout Santa Clara County. The RTC Clipper Card is a version of Clipper created for passengers with qualifying disabilities. Transit riders currently can use the RTC Clipper Card's special Clipper features to pay their fares on VTA and most Bay Area Transit Providers. 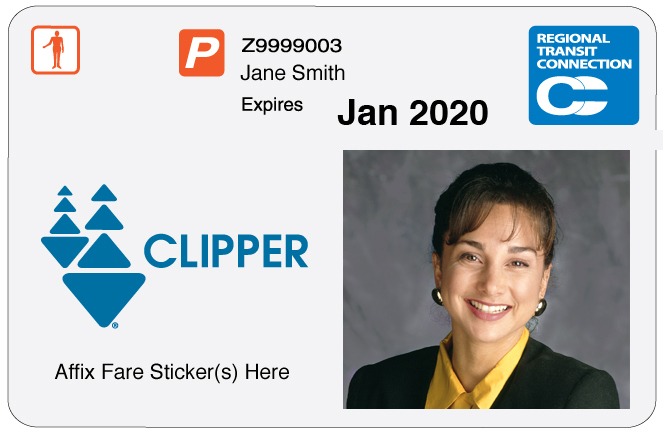 Passengers who travel on transit agencies that do not yet accept Clipper can use the RTC Clipper Card as proof of eligibility for reduced fares or a senior/disabled monthly pass or sticker. The RTC Clipper Card is issued to qualified persons with disabilities. Persons who require the assistance of another person to travel may obtain a Clipper Attendant Card. The card, when tagged on the Clipper reader, entitles the bearer to ride for the appropriate Senior/Disabled fare. You have the choice of buying a monthly pass using Clipper or paying the daily discounted fare. Day and Monthly Passes are available only on Clipper Cards. Passes and cash value can be added to Clipper Cards at light rail Ticket Vending Machines, most Walgreens stores, and VTA's Downtown Service Center and River Oaks Administrative office. In Addition, you can add value to your card by visitingclippercard.com or by calling (877) 878-8883. Please register your Clipper card. For lost or stolen cards please contact Clipper Customer Service at (877) 878-8883. If you do not have an RTC Card you can still get discounted fare. Just present one of the following: Medicare Card, DMV License Plate Registration or DMV Disabled Parking Placard printout, a VA disability rating of 50% or more, or a valid card from another transit provider or proof of age (65 and older). All printed route schedules include corresponding route maps and route service times. Schedule maps are displayed at transit centers and light rail platforms. Watch Jeff Jokinen as he discusses using the RTC Clipper Card for fun and work. Then, Jolene gives helpful information about how to get the RTC Clipper Card, how to add value to your RTC Clipper Card, and how to use the card on VTA's buses and light rail trains.